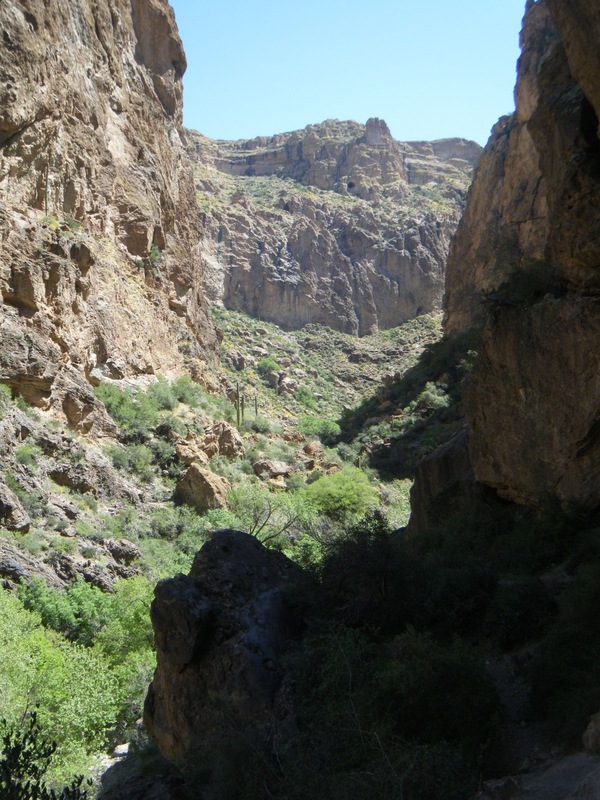 One of my first memories of travelling was when I went camping with my dad at Fish Creek in the Tonto National Forest of Arizona. I learned to put up a tent here, how to build a camp fire, and the way to make perfect smores. I also got to spend my first night by running water here, and ever since, the sound of a babbling creek is a noise that can invariably lull me to sleep. In is an oasis in the desert, and when there is water flowing down the creek, the water is smooth and clear, and gives refuge to a myriad of different animals. Fish Creek has played a pretty integral role in the type of person that I am now, especially when it comes to the relationship that I have with the natural world. I would argue that it is one of the most beautiful places that I know of in the Phoenix-area, but there are a few challenges in traveling out to this spot. 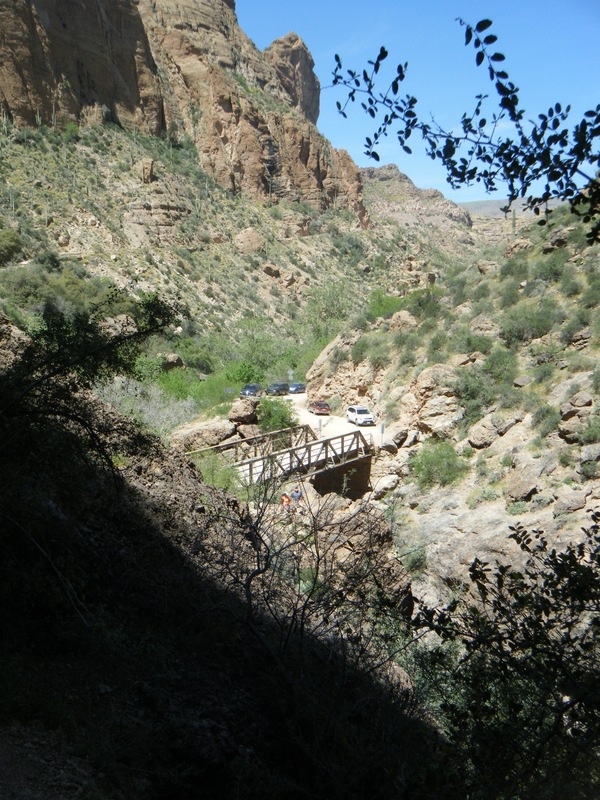 First off, it is a fair way down a dirt road (the Apache Trail), which is well-kept enough for cars to easily navigate, but the road is narrow and winds along the edge of intimidating cliffs. Due to this, it isn’t the most comfortable drive for everyone, and courtesy is essential from people traveling up or down the road. I have seen people get stuck in the ditch on the inner side of the road as they are trying to avoid the edge and let people pass in the other direction. There is also evidence, in warped road guards, that there have been close calls on this road before. Those planning on taking this road should be prepared for these conditions, and be ready to drive patiently and courteously. Once you make it down the steep road to the single-lane bridge that crosses over Fish Creek, it can be hard to find a place to park, and I would definitely suggest that you get there early. After parking, you cross over to the western side of the bridge and head south an unmarked but fairly obvious trailhead. After that, things get somewhat complicated. The trail here, while being well traveled, goes off in several directions, and it can take some experimentation to find the best one, because they aren’t all very easy to travel. In particular, I would warn against the trail that runs furthest up the cliff side, because getting into the shallow cavern that crowns the top of the path into Fish Creek canyon involves some scrambling, and a hefty little jump if you aren’t particularly tall. The trails from the road lead to a hollow in the cliff face, which has a fairly steep floor, is covered in graffiti, and, and has a ceiling patched with the soot of past fires. 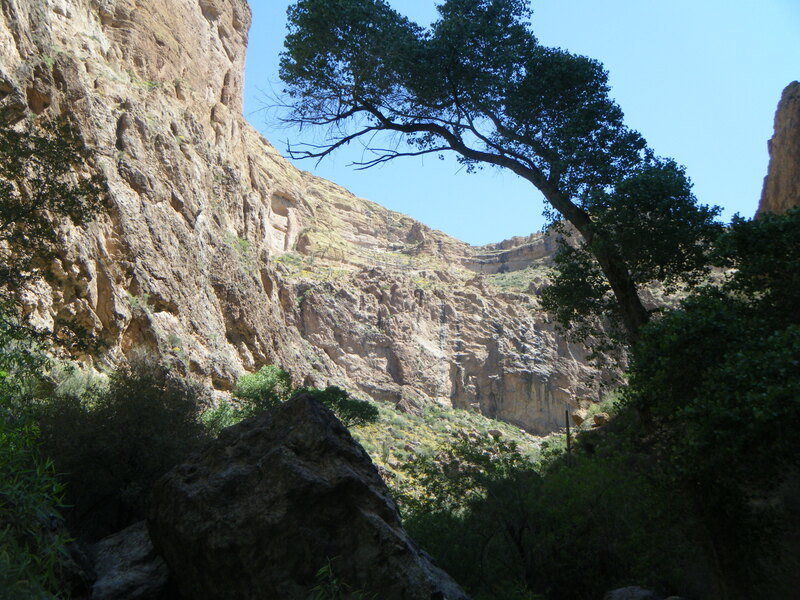 It isn’t the best place to hang out, but if it is quiet, there are some lovely views of the canyon and creek from here. Once you start to make your way down, the final and, in my opinion, biggest challenge presents itself. The trail down to the creek is very steep, and has many smooth rocks that are covered in a thin layer of sand. Sometimes this trail gets so slippery that it makes more sense to just sit down and slide down the trail, than to creep down on your feet and hope you don’t slip. Either method is precarious and the trail should be taken with caution. While hiking down, it is important to be aware that there may be people below you, so dislodging a rock is potentially very dangerous. 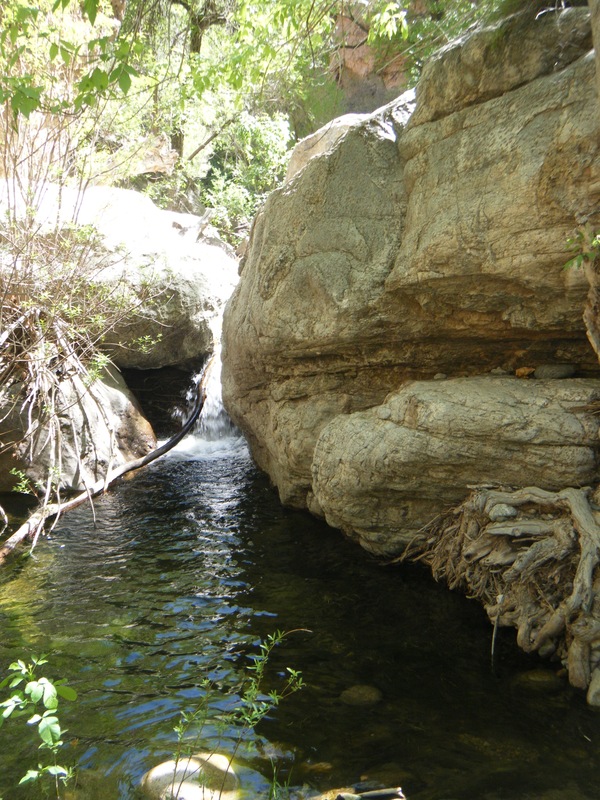 Down at the bottom, even if you don’t decide to hike and boulder your way up the canyon, the beautiful canyon walls, lined with lush green riparian trees, and the cool water at the bottom (when the creek is running) makes the challenging travel worthwhile. Of course, in order for Fish Creek to remain beautiful, people need to respect this place. Trash isn’t all that uncommon, but visitors that are aware can change this fact. Come prepared to pack your own trash out of the canyon, and if inclined, help clean up the canyon a bit. It is a contemplative, refreshing place when people respect eachother and the area itself. I usually travel south as soon as I get into the canyon, and travel in this direction takes some problem solving and a willingness to scale boulders along the way. I have never made it more than a mile or two into the canyon in this direction, because the bouldering can get pretty technical further down the canyon, but the trek is well loved. Last time I went, besides the creek being alive and well, there was a ton of birds and butterflies around. I think that at times there are canyon tree frogs in this area as well. No trip down to Fish Creek is complete without a stop for lunch at Tortilla Flats. This area is pretty busy, but the crowds don’t detract from this place too much. The food at the Tortilla Flats restaurant is pretty good. I am especially fond of their hot dogs. One thing I would say, however, is that if you are used to good Mexican food, stick with their American stuff cause that is their forte. After lunch, stop by the ice cream shop. They have prickly pear ice cream, which I traditionally get when I am in the area, and a bunch of other great flavors. If you still have time after that, check out the gift shop and the little museum that they have there. There’s some interesting history here, and some quirky little things in the area. Oooh I want to go! This sounds so fun down to the places you can eat at if you keep hiking! Definitely check it out! I love that area so much. It is so beautiful, and it isn’t even that far from the city.